It’s 2016. As we start to make our New Year’s resolutions (eating healthy, working out), it’s important to make a business-oriented resolution. This is the perfect time to take a step back and analyze how your past year has done, and see where you want this year to take you. 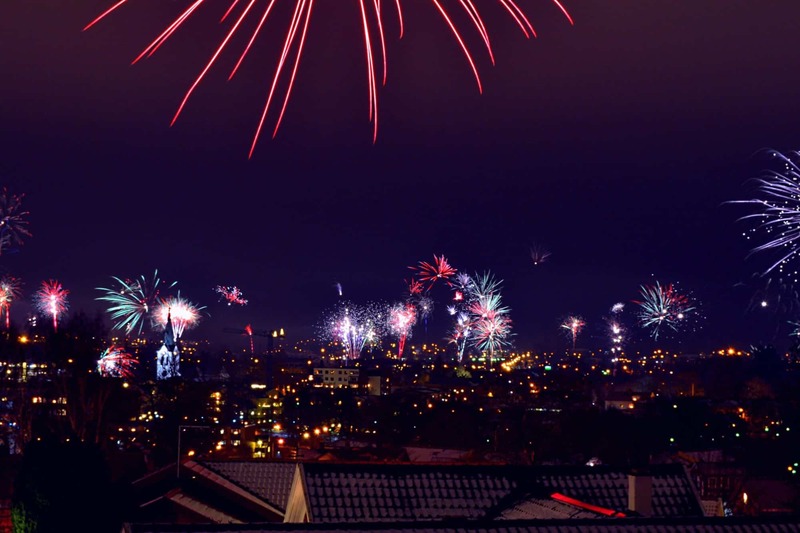 Below are three ways to start the New Year off right with your social media management. Refocus on why you got social media profiles in the first place. Were all your original goals met? What was the objective for getting Facebook, Twitter, Instagram or Google+? Think about how you want to expand your profiles and what you want your customers and clients to get out of your profiles. Do you want to get more likes? Reach more people through advertising? Post quality content? Make goals for 2016 and do everything you can to reach them. Now that you have goals set, create a strategy that will help you achieve those goals. 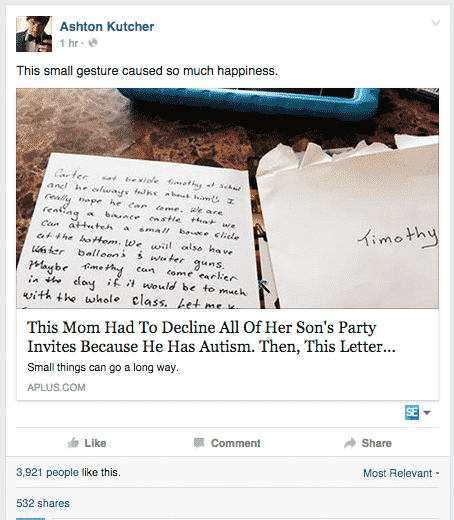 Going into a social media campaign blind is dangerous. And your goals will not be met. Focus on your goals and make a plan that will help you achieve your goals. If you strategy isn’t working, it’s okay to fix it and try again. 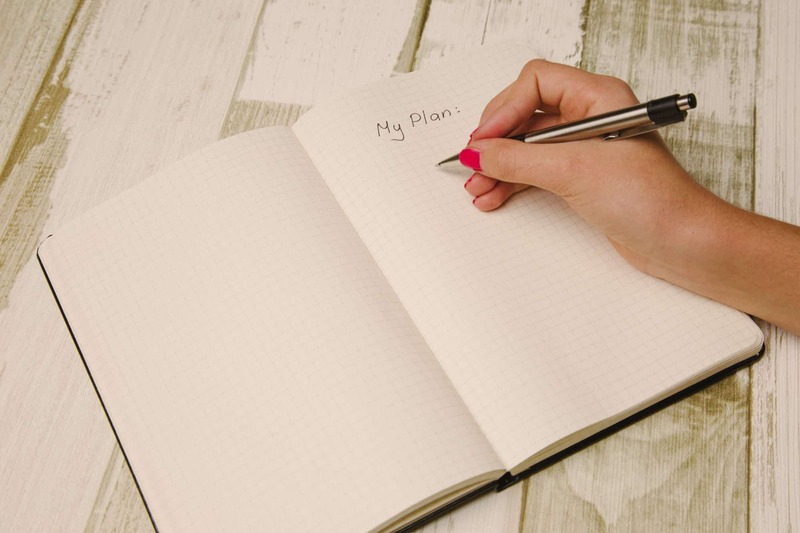 It’s okay if you need to start from scratch and try all over, but create a plan before starting a campaign. It’s the perfect time to go through your social media profiles and check to see if everything is correct: address, phone number, hours, etc. Is there anything on your profile that is inaccurate, doesn’t relate or no longer useful? Clutter makes important messages get lost easily and people skim over junk. Display only useful, quality content on your pages and address all questions, comments and concerns. It’s not enough to just have a social media account – you must make a presence on the various platforms. What’s the point of having a Facebook page if you aren’t going to use it. Social media has made it easier than ever to communicate with customers around the world. 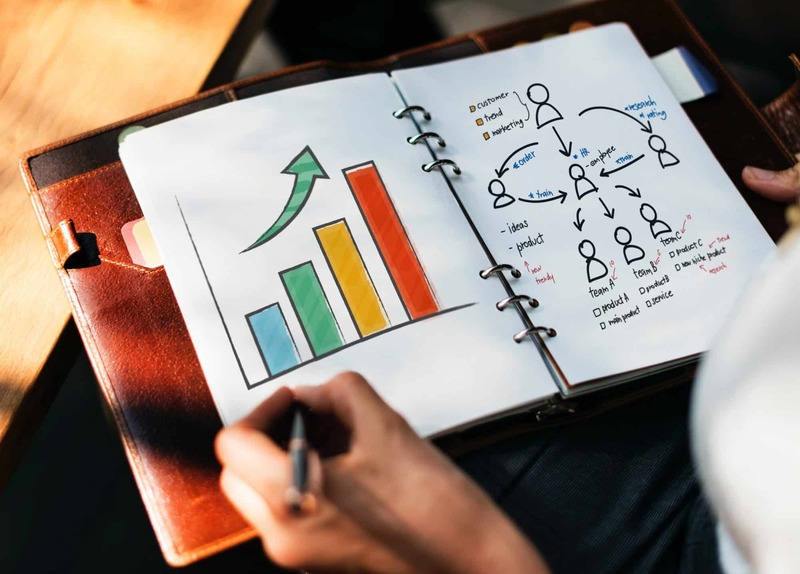 Businesses can share deals, sales and general information where customers and clients can communicate back and fully share their experience by writing a review. Below are six ways to boost your social media presence. By engaging with your customers you’re showing that you are a real human. Everybody is sick of automated voice calls or talking to someone overseas. By discussing trending topics, you show your audience that you are aware of the latest buzz and ready to get on board with that conversation. Everybody has an opinion. And it seems at this day in age, that everybody loves to express their opinion on social media sites. Look for those opportunities and grab them. Communication is key in any relationship. Listen to your audience and understand their needs. Social media is not a way one form of communication. You’re not meant to talk at your audience, but with them. Your audience won’t pay attention to your social media profiles unless you’re producing good, interesting content that pertains to them in some way or another. Experiment to find out what exactly your target audience likes: stories, information, images, video. Besides breaking news topics, keep your content related to your business. Your audience has liked and followed your pages because you have a product or service that they want or need and they are specifically interested in that product. The fasted way to lose followers is by producing content that don’t want or need to see. It’s as simple as that. Engage with the customers who leave reviews. 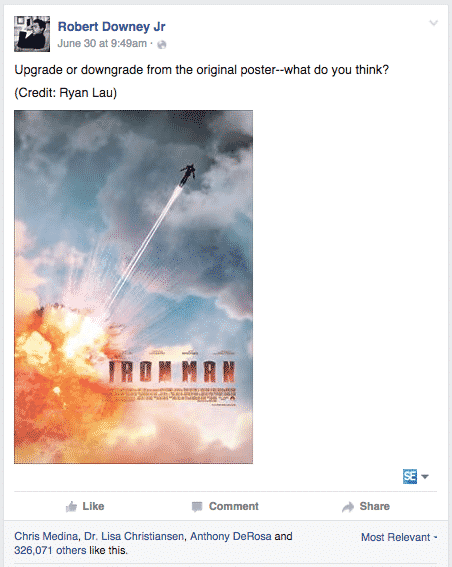 Engage with the customers who ask questions on your wall. Engage with the customers who tweet about you. Engage with the customers who send you a private message. Engage with everyone and they will communicate back. Hashtags have proven to bring more engagement to tweets and posts. Look for trending hashtags and strike up a discussion on your wall. Create your own brand hashtag and use it consistently. Give your audience a reason to engage with your business. Provide a benefit so they want to follow you and continue to support your business and social media presence. First dates are a work of art. We’ve all been there, we’ve all experienced the nauseated feeling we get as we wait for the doorbell to ring or experience the (what-seems-like-forever) walk to the door. We’re already dreading something that hasn’t even happened yet. And there’s a 50% chance we might actually have a good time on this particular date. So, why do we feel this way? Maybe it’s that we get so comfortable with what we know, that we are afraid to branch out and try new things. i.e., everybody freaked out when Facebook added the timeline to your personal wall. “If it isn’t broken, don’t fix it” – everybody on my newsfeed after that incident. So what, Facebook changed in appearance and a little in how we do things? Did it make it better? Eh, that’s debatable. It definitely didn’t make it worse. The point is, Facebook forced us to get out of our comfort zone and try something new. The real question is, how have we coped when new social media sites have come along? Twitter was an instant success and Instagram took off. So we weren’t afraid of those sites. Google + hasn’t been doing nearly as well as it thought it would and Ello is barely in existence. Some social media sites hit it off and others don’t. But, why do we like certain sites and not the others? Did we try a “blind date” with all of them and decide which sites we agreed to go steady with? I’ll admit, I’m not that keen on certain ones either. I tried out Twitter, but I haven’t fully committed but Instagram has stolen my heart. One of the problems could have been that Twitter only allows so many characters in one tweet (trust issues). How can you trust something when you may not be getting the full story?! The whole point of this rant is that maybe we should give all social media platforms a try before dumping them before the relationship starts. Just like a good, old-fashioned blind date, trying a new social media platform is a good thing to do before committing to just one. Try them out, see what you like and don’t like about each platform. And give them time. Sometimes you just flat out need some good quality time alone with each of them to find out what works for you and what doesn’t. No matter what happens, Facebook will always be there to welcome you back. Ever wonder why you posts and tweets are receiving that much engagement? 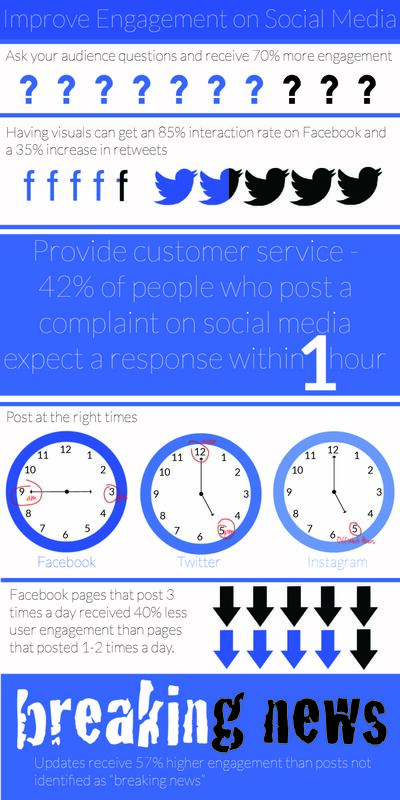 Are you posting the right content at the right time on the right platform? Below are some tips and tricks to help you receive higher engagement across your social media platforms. 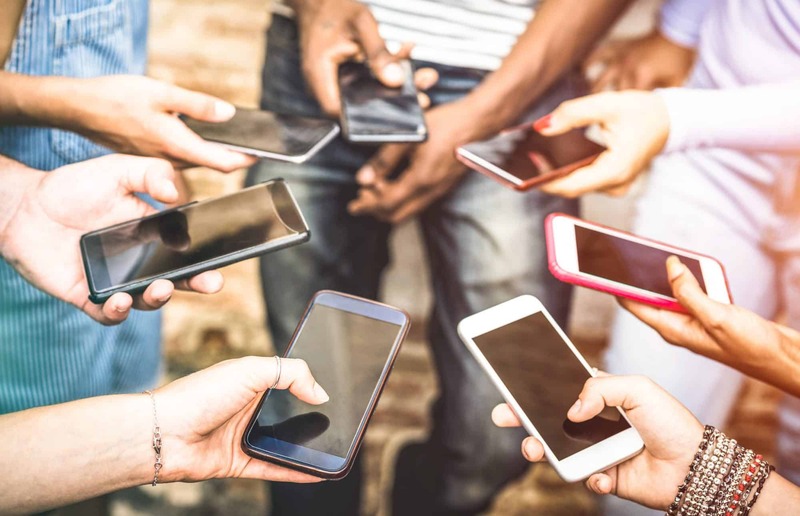 Between Facebook, Twitter, Instagram, Tumblr, and Vine almost everybody has a social media account on one platform or another – including celebrities. Whether they are musicians, actors or authors they are tweeting and sharing information about their lives. However, some celebrities are better than others. Let’s take Shia LaBeouf as an example. He fits into the not so good category. For a month he tweeted “I am not famous anymore.” Nothing else. No explanation. And it’s funny, because he is still famous. Shia gets into the habit of repeating the same tweets over and over again for weeks at a time: “Start Creating”, “Stop Creating”, let me show you how many miles I ran with my Nike+, “Follow my Heart” in many different fonts… you get the picture. While some celebrities may not be the greatest at tweeting and instagramming, some are above amazing. 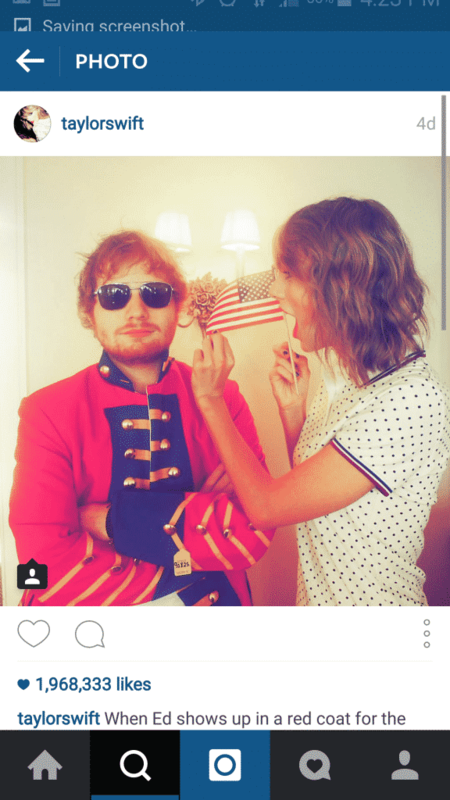 Here we are going to talk about the ten best celebrities and their social media platforms. Let the countdown begin. As much as I hate to admit it, Kim made the list. But with her 38.4 million Instagram followers, 33.2 million Twitter followers and 25 million Facebook likes how could she not? Although, that is the only reason she is on the list. 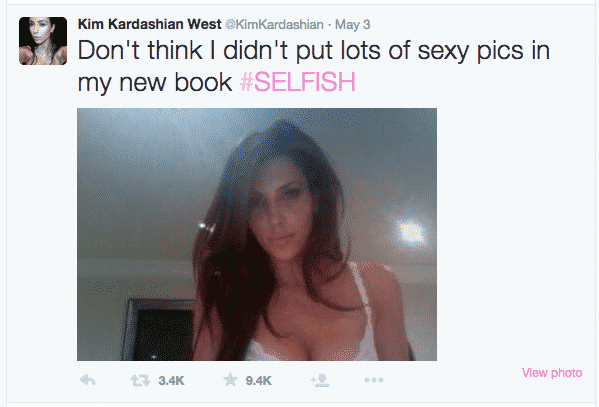 She isn’t doing the world any good through her social media platforms (Ian Somerhalder, Sophia Bush, Emma Watson…) but clearly, people like her and her selfies. 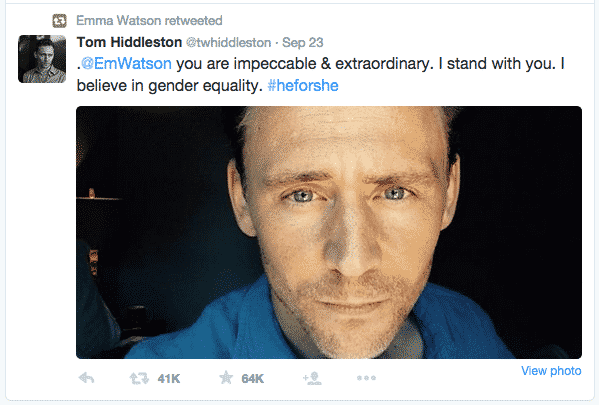 Emma is constantly informing her 18 million Twitter followers and 30 million Facebook followers on the HeForShe Campaign and gender equality and still has time to root for the England National Women’s soccer team. She knows what’s important and what needs to be shared. Even on social media, Emma presents herself in a professional way and is capturing everyone’s attention, including other celebrities. It’s almost like she knows magic or something. Ashton uses Facebook as his main social media platform to talk about the definition of beauty, women’s rights, and other social issues with his 17 million fans. He knows how to start – and keep – a conversation going, even on tough subjects. 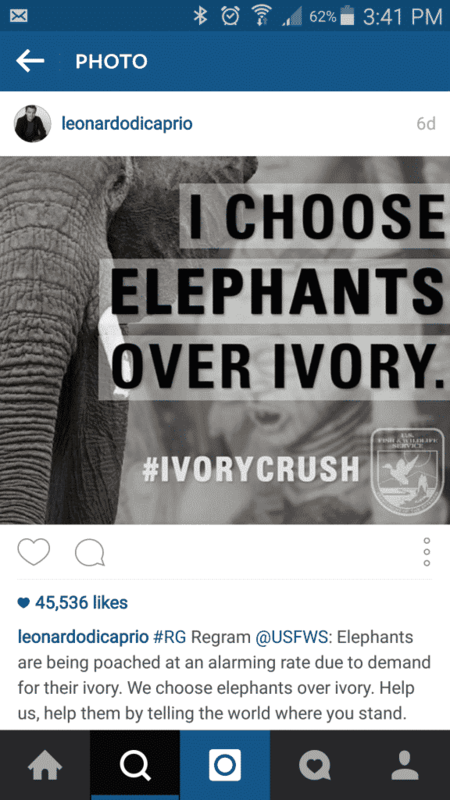 Unlike Kim Kardashian, Leo uses social media to promote charities and other organizations that he works with. Between Oceana, the Elephant Crisis and oceanic conservation projects through his foundation, Leo has pledged $11 million and shares the information on his social media platforms, so you too, can help. And with his 13.1 million Twitter Followers and 985K Instagram followers, people around the world are learning how they can make the world a better place. He hasn’t won an oscar yet, but he’s won our hearts. Anna has been known for fangirling moments with other celebrities, which she hilariously tweets so the whole world knows she met Beyonce. Her thoughts are hilarious and I’m sure her 4.42 million followers are glad they get to read her mind. And not to mention, she’s a fan of The Bachelor and isn’t afraid to let everyone know. First of all, anybody who writes Harry Potter automatically gets added to the list. Secondly, Jo is amazing to her fans. She’s constantly answering fans questions on Twitter and retweeting what’s important to her. She also spends time tweeting about her non-profit organization, Lumos, to her 4.8 million fans. 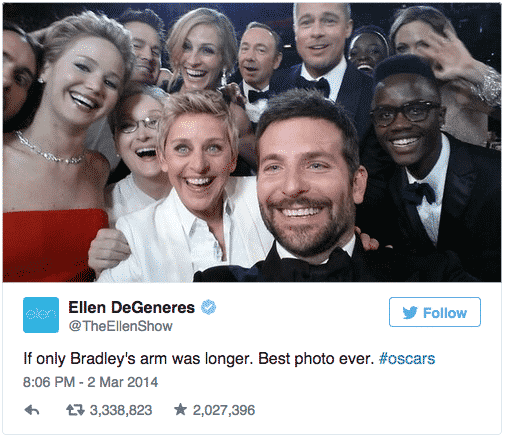 Ellen is constantly making her 45 million Twitter followers laugh. Between her #MondayMotivations and #YoureWelcomeWednesdays, there is always something to look forward to throughout the week. She keeps up on celebrities birthdays and national news in a light-hearted and fun way. And let’s not forget the most famous Oscar selfie of all time! With over 3 million retweets, this photo made history. John has a unique approach with his social media presence, but I’m sure his 2.5 million YouTube subscribers won’t complain. The author and his brother, Hank Green, have a YouTube channel called vlogbrothers where they vlog about important issues like health care reform, social equality and more. He then gets on his Twitter account to raise awareness and promote his new books/books turned movies (which we all love!) to his 4.3 million followers. It might be a different approach, but it works for him. In March of 2014 RDJ started his Facebook experience with a post explaining that he’s a “late bloomer” to social media but “basically, here goes.” Since then, he has doubled his Facebook following and currently has 25 million likes. He engages with his followers, asks questions and posts relatable status updates. With The Avengers: Age of Ultron recently coming to theaters, RDJ has kept to an Avengers/Iron Man theme, and his fans are going crazy! 71 million Facebook likes, 60 million Twitter followers, 36.7 million Instagram followers, 1.3 million YouTube subscribers, 2.5 followers on Google+, 13K followers on Pinterest and her Tumblr… need I say more? Taylor is great at sharing photos of her life and making her seem like a genuine, down to earth person that we all want to be friends with. Seriously, can we just be best friends? #thisisnotwhatahashtagshoudlooklike. It’s frustrating being a social media marketer and scrolling through my personal newsfeed seeing hashtags used improperly. Let’s go back to the beginning. Despite the popular rumor, Twitter did not invent the Hashtag. Hashtags started in the late 1990s where it was used to categorize items into groups on Internet Relay Chat. However, Twitter did make Hashtags popular when Chris Messina became the first person to use the hashtag on Twitter. He asked his followers how they felt about using the pound sign to group conversations together in 2007. The rest is history. Twitter adopted the Hashtag and other social media platforms followed suit. Let’s talk about Twitter. Tweets that contain hashtags receive two times more engagement than tweets without a hashtag. And tweets that contain two Hashtags have a 21% higher engagement rate. So, obviously Hashtags are important. But this is where it gets tricky. A tip for all my Hashtag-happy friends: there’s a 17% decrease in engagement when tweets include more than two Hashtags. You have to know where the line is, and know not to cross it. Another big no-no with Hashtags: using more than three words. #NYpizza is great. #IloveNYpizzasomuch is obnoxious. Tell your followers and friends what you want to say and use the Hashtags as a grouping method. After all, that’s why Hashtags were started by Chris. There is also no benefit to #hashting #every #single #word. See how annoying that was? Now that you know some basic etiquette for Hashtag use, try using it in your next marketing campaign. Hashtags have become popular with brands and their advertising efforts (remember Travelocity’s #IWannaGo campaign?). When creating a Hashtag for your next campaign research what your audience is already talking about and create a unique Hashtag that is relevant and appropriate. Keep it short and simple and but brand specific. This will make it easier to remember and spell for your customers. Your business can try a campaign Hashtag, #IWannaGo, which is typically used for promotional giveaways or an incentive to want to use the Hashtag, or a brand Hashtag #HaveABreak. A brand Hashtag should be kept consistent on all social media platforms and for a longer period of time. 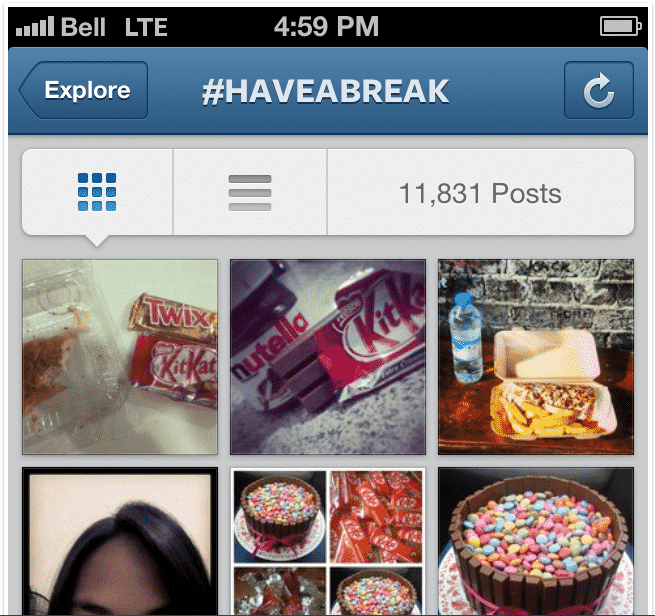 Kit Kat’s #HaveABreak Hashtag is brand specific (their tagline), unique and simple. Kit Kat uses it across all social media platforms, allowing their consumers to engage with the Kit Kat community online, in turn, generating free buzz. So, just remember, keep it simple, relevant and don’t overuse Hashtags, and you’ll be just fine.